With the introduction of OS X Lion, Apple made fundamental changes to how OS X is sold and distributed. Install DVDs are history; OS X is now available as a download from the Mac App Store. With the elimination of install DVDs, Apple needed to provide alternative methods for installing the OS, repairing startup drives and system files, and reinstalling the OS. All of these capabilities were formerly available on the install DVDs. Disk Utility: for repairing damaged drives and system files. Safari: to allow you to go online and research any problems you may be having. Reinstall OS X: which can be used to install a new copy of the OS on your Mac. Restore From Time Machine Backup: for those times when everything has gone wrong and you need to restore data from your backups. Terminal: for working with the Mac's file system or editing files. Network Utility: in case you need to troubleshoot networking issues. Firmware Password Utility: to set up or remove firmware passwords, one of the security options for OS X. As you can see, the Recovery HD can do a lot more than just install the OS. It provides nearly the same services that were included on the older install DVDs, just in a different location. Under normal operations of your Mac, you probably won’t notice the existence of the Recovery HD volume. It doesn't mount on the desktop, and Disk Utility keeps it hidden unless you use the debug menu to make hidden volumes visible. To make use of the Recovery HD volume, you must restart your Mac and select the Recovery HD as the startup device, using one of the following two methods. Restart your Mac while holding down the command (cloverleaf) and R keys (command+R). Keep holding both keys down until the Apple logo appears. You can also restart your Mac to the startup manager. This is the same method used to boot into Windows (Bootcamp) or other OSes you may have installed on your Mac. There is no advantage to using this method; we included it for those of you who are used to using the startup manager. The startup manager will check all attached devices for bootable systems. Once the startup manager begins to display the icons of your internal and external drives, you can release the option key. Use the left or right arrow keys to select the Recovery HD icon. Press the return key when the drive you wish to boot from (the Recovery HD) is highlighted. Your Mac will boot from the Recovery HD. This process can take a bit longer than a normal startup. Once your Mac finishes booting, it will display a desktop with an open Mac OS X Utilities window, and a basic menu bar across the top. Now that your Mac has booted from the Recovery HD volume, you're ready to perform one or more tasks on the startup device that you were unable to perform when actively booted from the startup volume. To help you, we've included appropriate guides for each of the common tasks for which Recovery HD is used. From the OS X Utilities window, select Disk Utility, and then click Continue. Disk Utility will launch just as if you were using the app from your normal startup drive. The difference is that by launching Disk Utility from the Recovery HD volume, you can use any of Disk Utility's tools to check or repair your startup drive. For detailed instructions, take a look at the following guides. Remember that if a guide asks you to launch Disk Utility, you've already done so at this point. Once you finish using Disk Utility, you can return to the OS X Utilities window by selecting Quit from the Disk Utility menu. From the OS X Utilities window, select Get Help Online, and then click Continue. Safari will launch and display a special page that has general instructions about using the Recovery HD volume. However, you're not restricted to this simple help page. You can use Safari just as you normally would. Although your bookmarks won't be present, you'll find that Apple has supplied bookmarks that will get you to the Apple, iCloud, Facebook, Twitter, Wikipedia, and Yahoo websites. You'll also find various news and popular websites bookmarked for you. You can also enter a URL to go to the website of your choice. Once you finish using Safari, you can return to the OS X Utilities window by selecting Quit from the Safari menu. In the OS X Utilities window, select Reinstall OS X, and then click Continue. The OS X Installer will start up and take you through the installation process. This process can differ, depending on the version of OS X that's being reinstalled. Our install guides for recent versions of OS X will help you through the process. Restoring your Mac from a Time Machine backup will cause all data on the selected destination drive to be erased. 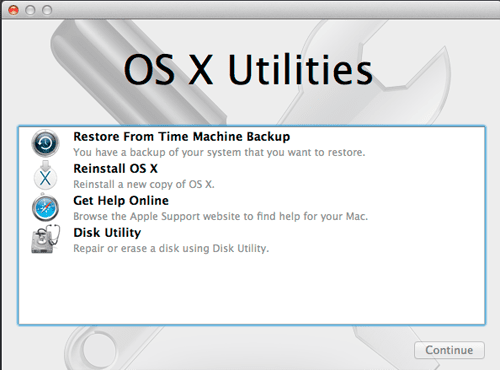 Select Restore From Time Machine Backup in the OS X Utilities window, and click Continue. The Restore Your System application will launch, and walk you through the restore process. Be sure to read and heed the warnings in the Restore Your System app. Click Continue to proceed. Follow each step outlined in the Restore Your System app. When the process is complete, your Mac will restart from the destination drive you selected. The Recovery HD volume can be a lifesaver, at least when it comes to troubleshooting and repairing problems with a Mac. But the Recovery HD volume is only created on your Mac's internal startup drive. If anything should go wrong with that drive, you could find yourself in a pickle. That's why we recommend creating another copy of the Recovery HD volume on an external drive or a USB flash drive.